Deck the halls! 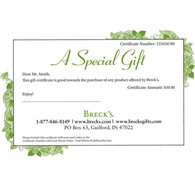 Breck's Gifts ventures far and wide to find beautiful home decor that reflects the inspiration of nature, and keeps a spirit of wonder and whimsy alive year-round. Whether you're shopping for a housewarming gift or warming your own hearth, Breck's Gifts has the decorative touches you need for every season!